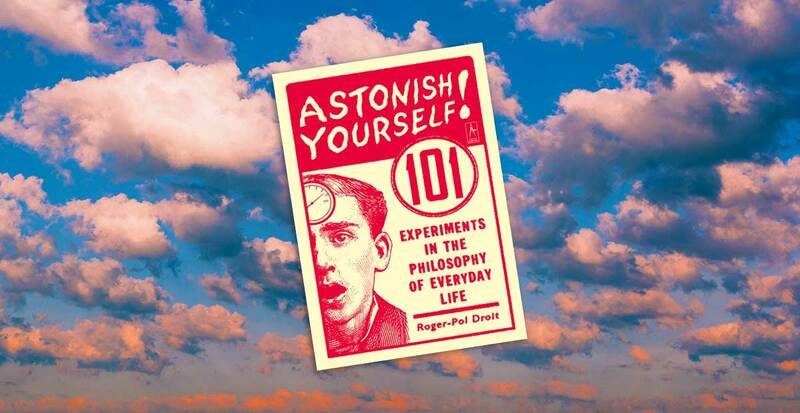 I came across Roger-Pol Droit's Astonish Yourself at the Califonia Science Center museum shop about 10 years ago. I was attracted to its bright red and yellow cover. When I flipped through it, I was even more intrigued. It had 101 simple self-experiments designed to change your consciousness and to better understand yourself. One of the experiments in the book challenges you to prolong the "Where am I?" experience people sometimes have when they wake up and it is still dark. Yesterday I woke up in a motel room and I didn't know where I was, who I was, how old I was, what kind of work I did, or where I lived. I felt the opposite of fear. I liked the experience of my life being an utter mystery to me. I knew that this was one of the experiments in Astonish Yourself, and I tried to prolong this mental state for as long as possible by not probing my mind. I was able to maintain the state for about 3o wonder-filled seconds before the facts fell into place. In 2004, Droit wrote an article with instructions on how to conduct 10 self-experiments.